Connect a panel-mountable USB port to your motherboard header.. 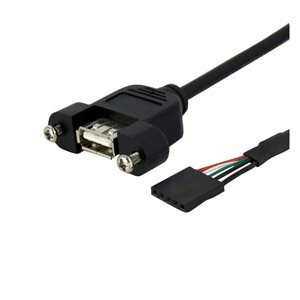 This 1ft USB to Panel mount USB cable features a 5-pin motherboard header connection on one end and a panel mount USB A (female) port on the other, providing a simple and easy to access USB 2.0 port on a panel mount receptacle.The USB panel mount cable offers a convenient solution for connecting bootable thumb drives or authentication fobs etc. to the motherboard USB connection.